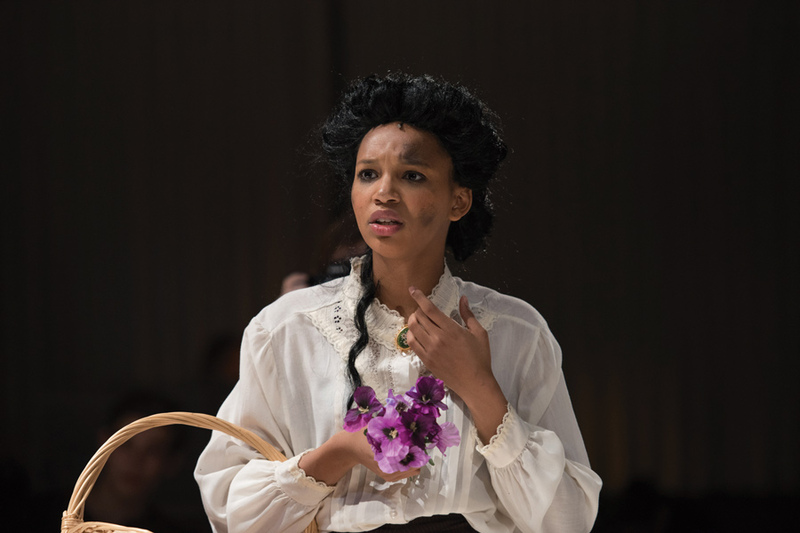 Kaja Burke-Williams plays Eliza Doolittle in Wave Productions’ performance of “My Fair Lady” in February. Wave Productions is part of the Student Theater Coalition — one of the organizations a new student petition is calling to move away from paper forms for general auditions. As Communication sophomore Shane Eichstaedt sat in general auditions for spring productions Saturday and Sunday, they said they watched hundred of sheets of paper go to waste. “I was heartbroken to have piles and piles of paper that represented all of the accomplishments of my peers just tossed into a recycling bin,” Eichstaedt said. After this experience, Eichstaedt, the director of “Project NU,” decided to create an online petition to make general auditions paperless. The petition, created Sunday, had more than 130 signatures as of Monday night. Eichstaedt said they didn’t create the petition out of anger — they just wanted to reach people. Moving forward, they plan to discuss the matter with officials at the Virginia Wadsworth Wirtz Center for the Performing Arts and Northwestern Student Theatre Coalition. Students must print a form for each show at general auditions because they go by too quickly to pass out papers to specific groups, Wirtz Center production manager Dixie Uffelman said, and up to 16 shows can be casting through these auditions. This quarter, more than 200 people auditioned over the weekend for this year’s spring productions. Uffelman said it’s recommended that those auditioning bring a headshot, and some also bring a resume, meaning each person uses up to three pieces of paper. With 16 shows and 200 people, this could add up to about 9,600 pieces of paper. Most of the paper will be thrown away or recycled, Uffelman said. Communication senior Matthew Burgess, a co-chair for StuCo, said the coalition has considered the issue before. Though StuCo didn’t mark it as urgent for this year, the group is willing to consider solutions given the many needs of different groups, he said. Third-year Communication graduate student Jeffrey Mosser said the paper usage was an “insane waste.” Though he said he would be interested in learning about potential solutions, Mosser, who has directed three shows at NU, said part of his casting process is spreading physical headshots out on the floor. “(If general audition packets went digital), I would probably print that person’s resume out just so I could scribble notes to myself on it, or on my own notepad connecting those dots,” Mosser said. Caitlin Lowans, another third-year Communication graduate student, said paper headshots could be put on file for a few years, but there is too much turnover at universities for that to be practical. One alternative the petition suggested was to use a Google Form for audition information that could be shared with students and directors. Overall, Lowans said she would rather trade some convenience for less waste and easier access online. Though using online copies could make it hard to focus, paper copies can already distract directors from performers, Lowans said. Eichstaedt said the forms could also be uploaded on an app or another platform created by a student. They added there have already been some moderate steps toward going green: StuCo accepts digital preference forms now, and Eichstaedt — along with some other directors — uses a Google Form for callbacks.